Beloved Meher Baba with His lovers in Kattavari thota Eluru. Memorable instances during His second visit to Eluru from 22-2-1954 to 24-2-1954:It was announced in news papers and palmplets that on 23rd February Baba will give “darshan”. A small school going kid on seeing the palmplet wished to have Baba’s darshan and asked their parents to take him to His darshan. The child’s parents were traditional orthodox, therefore they were not interested to take their boy to Baba having a wrong conception that Baba belongs to Parsi community. The boy wept , observed fasting, and slept while keeping the palmplet under his pillow. On the next day the boy went to school with broken heart. Eventhough the boy was in school , his heart was filled with the love for Baba, no concentration on the lessons and worrying about the darshan of the Beloved. The boy has not seen Baba in person , but saw the picture on the paper. All of sudden and in surprise Baba’s car was stopped at the school where the boy was. No sooner Beloved approching the kind than the kid ran towards the Him with fascination. Baba embraced the kid and kissed. 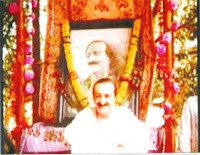 Avatar Meher Baba Eluru center was started on 07-01-1952 and registered under R.No.264/1985 dated 30-8-1985. The center has two segments one “ Avatar Mber Baba Nilayam” and the other “Avatar Meher Baba Eluru Center”. The center is located at Katta Subbarao Thota (garden), Meher Nagar, Gavaravaram, Senivarapupet. About one Kilometer ( half mile) from Eluru Firestation. Located by the side of Tammileru. Golden Jubilee celebrations:Avatar Meher Baba Eluru center celebrated “Golden Jubilee” in 2003. Sri Chenna Raghavendra rao and K. Haranathbabu are the then President and Secretary respectively. Draft planning was made for the celebrations by Sarvasri A.V.Raghavulu, B. Ramakrishnayya, Y.S.Rao, T.V.Padmanabham, K. Narayanarao, K.V.Ratnam and C.Y. Chintamani. A special souvenir was published on the occasion. Gatherings , bajans are conducted on every Thursday and Sunday. Special meetings are conducted on all important days. Special function will be organised on every year December 25th. “Nagarasamkeerthana” ( Street singing) is organised at the early hours 5.00 am to 6.00 am on every Sunday. Tours to Beloved Tombshrine are organised every year arranging special buses.